The T-26-4 is a Rank I Soviet light tank with a battle rating of 1.0 (AB/RB/SB). It was introduced in Update 1.51 "Cold Steel". It is a variant of the T-26 with a 76 mm howitzer. 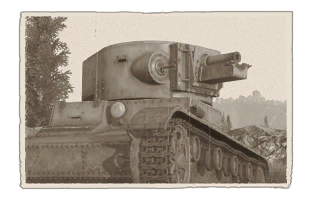 The T-26-4 is rather unusual tank, combining average speed, thin armour and a large gun. It uses the same hull as T-26 and an enlarged turret, able to mount the 76 mm KT-28 howitzer. This tank and its gun can be roughly compared to its German peer, the Pz.IV C, and its 7.5 cm KwK 37 L/24. However, it is vastly inferior to it in ALL terms. The penetration is almost two times lower, and shell travel speed is by about 1/4 lower as well. Reloading also takes a bit more time. Armour wise, they are the same, but Pz. IV C has 30 mm of armour at the front. The German tank is also a lot faster, with the HP/ton ratio almost two times better. To complete the list, it also has a mere -5° of gun depression, compared to -10° of the Panzer. 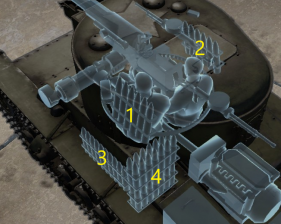 Lastly, Pz.IV C can also equip HEAT shells, to deal with better armoured targets. Suspension wheel are 10 mm thick while tracks are 15 mm thick. Ammo racks for the T-26-4. This tank should be used as either a close range ambusher/flanker, or as a direct supporter of friendly vehicles. Use its speed to exploit other tank's weak side or rear armour to deal a crippling blow. Try to concentrate your fire on lightly armoured vehicles, to which your gun is deadly. It's dangerous to go alone, take friends, otherwise you risk encounter with a tank that you won't be able to penetrate. Don't use HE shells on anything other than unarmoured vehicles, they are not as good as its calibre might suggest. Gun can easily kill any tank it meets with single shot, IF it penetrates. Manoeuvrability is quite good, although somewhat limited by its low top speed (30 kph). Decent reload speed and fast turret traverse speed. Horrible penetration with all types of ammo, even at very close range. Mediocre accuracy, combined with one of the slowest shell travel speeds in the game. Very thin armour, can't stop even the auto cannon shells from AA vehicles. Has very little chance of causing any harm at all to tougher tanks. Most aeroplanes can pierce your armour rather easily. The T-26-4 light tank is a variant of the T-26 light tank in Soviet services. Instead of mounting a 45 mm cannon as its main armament, the T-26-4 mounts the 76.2 mm KT tank gun and is intended to fill the role of an artillery tank. 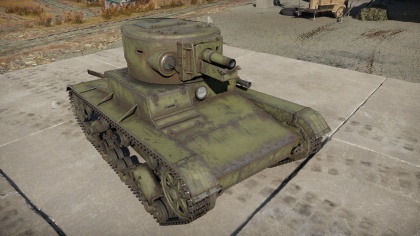 The turret looks similar to the T-28 medium tank, if not the same. The T-26-4 design was tested in October 1933 after five were built. It was in this test that the 76.2 mm KT cannon was chosen to arm it instead of the more powerful and innovative 76.2 mm PS-3 cannon. A production of 50 of these tanks was scheduled in 1935, but an incident in September 19, 1934 with a shell case destruction caused the military to cancel the T-26-4. The T-26-4 turret was then used on the BT-7A light tank intended for the same role. This page was last edited on 13 January 2019, at 21:55.